The Mueller's gibbons' range is Borneo. The habitat of Mueller's gibbon is deciduous monsoon and evergreen rain forests. 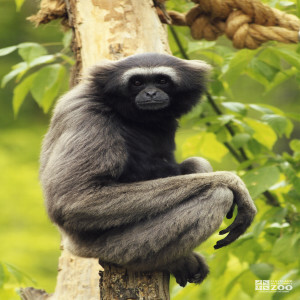 Hylobates means “Dweller in the trees”, and Mueller's gibbon fully justifes the name. They exceed all other animals in agility. Movement is primarily by brachiation, in which the arms are extended above the head to suspend and propel the body. Most traveling is by swinging from branch to branch through the trees. The hands are used as hooks, not grasping the limbs. When walking on the ground or on a limb the arms are held high for balance. Gibbons can leap from branch to branch for up to 30 feet. They are primarily diurnal and exclusively arboreal. Gibbons generally show preferences for small, scattered sources of pulpy fruit, which brings them into competition more with birds and squirrels than with other primates. Unlike the monkeys, which feed in large groups and can more easily digest unripe fruit, gibbons eat mainly ripe fruit; they also eat significant quantities of young leaves and a small amount of invertebrates, an essential source of animal protein. About 35% of the daily active period of 9-10 hours is spent feeding and about 24% in travel. They are monogamous, and an adult pair and their offspring occupy a small, stable home range, which is defended. They are strongly territorial. Social interactions are infrequent; there are few visual or vocal signals. Grooming is the most important social behavior, both between adults and sub-adults, and between adults and young. Play, centered on the infant, is the next most common. The inter-birth cycle in Mueller's gibbon is 2 to 3 years. The estrous cycle is about 30 days. Copulation is usually dorso-ventral with the female crouching on a branch and the male suspended behind, but occasionally they copulate facing each other. Infants initially cling around the mother’s body like a belt. Weaning is gradual, and usually completed early in the second year. Sexual maturity is attained at about 8 to 9 years.